Konami is on a roll with its streak of hits on the NES. Gradius was the first sign of greatness from the third party licensee when it launched last Christmas. Follow-up successes include the recent Game Pak releases: Rush ‘N Attack and Track & Field. Now we have something truly special with Castlevania, perhaps the most technologically impressive game to appear on the NES yet. It’s a clear example of how talented Konami’s teams of programmers are at creating immersive gameplay experiences unlike anything else in the home console arena. 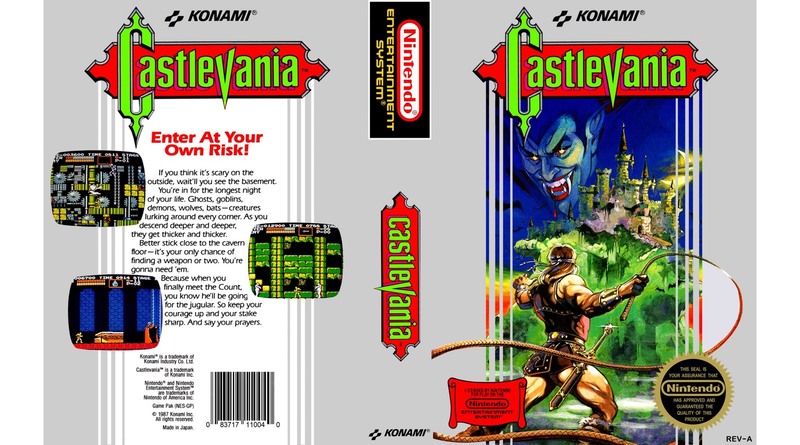 You play as an unnamed hero who has set out on an epic adventure to vanquish the curse of the Evil Count who has taken residence inside a haunted castle high atop a cliff overlooking the foreboding landscape of Castlevania. This mission will not be an easy one as there are many pitfalls to overcome and monsters to defeat if you are to survive this horrific night. Borrowing heavily from classic scary movies, you’ll come across a wide variety of spooky creatures, such as zombies, bats, skeletons, and mummies. You’ll even have to do battle against Frankenstein and the Grim Reamer before you face the most terrifying boss of them all: The Count! Thankfully you have many weapons at your disposal to send the enemies back to Hell. Your main method of attack is your trusty whip, which can be powered up twice over to transform from a short leather style up to a longer chain and ball Morning Star that will vastly increase your chances of survival. Scattered throughout the various levels of the game are candles that can be whipped to reveal special items inside them. Some of these will be secondary weapons that can prove vital toward your victory over the undead. These include the: Watch (temporarily freezes creatures in their tracks), Dagger (can be thrown in a straight line across the entire screen), Axe (very powerful weapon that can hit foes above you), Fire Bomb (a Molotov Cocktail that will burn anything in its path), and Boomerang (the best weapon in the game as it can deal double damage as it flies through the enemy and then back again on its return trip). In order to use these powerful special weapons you’ll need to spend Hearts, which can also be found inside candles or from defeating certain foes. Much like Super Mario Bros., there are secrets hiding in every stage of the game. You’ll want to whip every block you see, as some can be destroyed an will offer up special bonuses. Many times these will include Money Bags, which can add points to your overall score and contribute to you earning an extra life. You’ll also come across helpful items like the Pork Chop (refills some of your health) and the Double or Triple Shots (allows you to throw two or three special weapons at the same time). By properly exploring every nook and cranny of each stage you’re sure to amass the items necessary to rid the castle of the supernatural and put an end to The Count’s dastardly curse. You begin your quest outside the haunted castle with little more than your wits and an underpowered whip. As you progress inside the haunted abode you’ll pass through corridors that will have you travelling in every direction, up and down staircases, into the depths of the creepy basement where Fish Men jump out of the water and hurl fireballs at you. As you navigate your way through secret passages and various traps you’ll eventually come across a big red door. Passing through it serves as a checkpoint, so if you lose a life and you have some spare men in reserve, you’ll begin your quest anew from that spot. However, if you use up all of your extra lives you will be sent to a Continue screen and you will have to begin your adventure at the start of the area, retreading sections of the game you may have already conquered. To make matters worse, there’s a timer at the top of the screen that serves as a constant reminder to not dilly-dally around or you will suffer an instant death if it hits zero. Combat in Castlevania is very fun and original. The whip mechanic is refreshing to see in a video game (perhaps the developers are big fans of Indiana Jones?) and I really like that you can power it up to extend your hero’s attack range. Secondary weapons and special items are fun to find and work great against the enemies. Speaking of, there’s a wide variety of baddies here, and they all pose unique challenges. By far the most difficult standard enemies in the game are the ones that can fly around. You’ll have to deal with ghosts, bats, ravens, and worst of all, the dreaded Medusa Heads. They fly in a wave pattern that is hard to anticipate, and thus difficult to avoid. To make matters worse, if an enemy hits you your character is pushed quite far and can easily fall to his death with all of the hazards around. This can become extremely frustrating in some levels where they place flying enemies near bottomless pits and if you’re hit by a single one of them it’s basically an instant death. Learning the enemy patterns and getting the timing just right is a necessity to pass through unscathed. You’ll need as much of your health bar as you can manage for the bosses, as they become tougher and more grueling as you get closer to The Count’s lair. The game is difficult, but manageable and never approaches the brutal challenge of Capcom’s Ghosts ‘N Goblins. Graphically I think it’s fair to say that Castlevania is one of the best looking games on the NES to date. It features detailed environments that really help set the dreadful atmosphere that permeates the entire game. From dilapidated castle corridors to underground caverns, the game is a visual feast for the eyes. The classic monster enemies look really good and have a decent amount of animation to give them some realism. While the bosses could stand to be a bit bigger and more menacing, the standard enemies are really the standouts here. The most impressive is probably the skeletons, who actually throw a bone at you as a weapon. Although this is by far the most detailed presentation that Konami has delivered, there is a small amount of flickering present when multiple enemies appear on the screen. This appears to be something that we’ll just have to live with on the NES, although I will say it’s nowhere near as bad as some previous games and thankfully the entire game doesn’t slow down as that would make jumping from platform to platform even more difficult than it already is. The music in Castlevania is simply divine and really does an amazing job of matching the visuals to create an immersive experience that really shines. Every three stages or so you’re treated to a brand new track, each seemingly better than the last. The music has a certain sound to it that evokes horror, but also has a sort of upbeat get-your-heart-pumping rock aesthetic to it that complements the action on-screen perfectly. It’s hard to believe how far we’ve come in the audio department in just a few years on the same NES hardware. It’s obvious that the sound designers are really coming into their own and are creating masterful 8-bit melodies that are sure to get stuck in your head long after you’ve turned the game off. Castlevania is a great game that every owner of a Nintendo should consider. Due to its horror genre, it definitely won’t be for everyone, and younger kids should probably stick to more suitable titles. There’s nothing graphically gruesome here, but the nature of the monsters and the setting will undoubtedly turn away some parents out there. Despite some questionable hit detection with enemies and moving platforms and staircases (you might fall right through them on occasion, leading to an untimely and unfair death), the overall gameplay is solid. There’s enough challenge for most players and the game is a delight to experience. If you’re a fan of classic monster movies, Castlevania should be the perfect game for you! Computer Entertainer awarded Castlevania 3.5 out 4 for graphics and 4 out of 4 for quality of game play and entertainment value. It received a Recommended rating. Ed Semrad gave Castlevania a 9.5 out of 10.